Galveston Island is a city known for its wealth of nineteenth and twentieth-century architecture. The Strand/Mechanic Historic District is among the island’s most significant collection of architecture, with more than 45 buildings in 12 blocks of significant architectural merit. This district, whose buildings date to the 1850s, has stood resilient to the point of heroic defiance though economic and natural disasters. 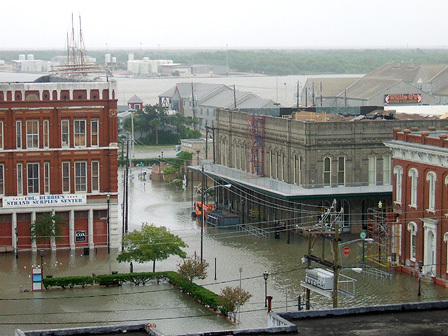 On September 13, 2008, Galveston Island took a direct hit from Hurricane Ike. The streets and buildings in the Strand/Mechanic District were inundated with seawater, oil and debris. The buildings were immersed in up to 13 feet of water, which obliterated interiors and swamped mechanical systems. High winds damaged roofs. Water stood in these structures for more than two days, seeping into irreparable historic fabrics. Galveston urgently needs and deserves a renaissance.